Turn off the undersink valve that feeds the cold water faucet on your sink, then disconnect the flexible connector that attaches to it. Screw the female side of brass MAX adapter onto the valve, then attach the flexible cold water line to the top (male) thread of the MAX adapter. Screw the quick connect fitting onto the remaining male thread of the MAX adapter, then push either end of the 1/4" inlet tube into the fitting. Push the other end of the 1/4" inlet tube into the “In” port of your water filter or reverse osmosis unit. 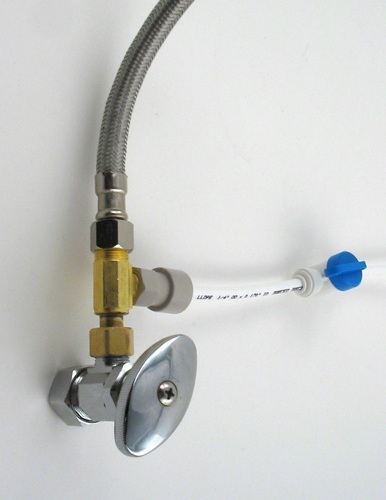 Be sure that the inline valve in the tube is off (blue handle perpendicular to the tube). Turn on the cold water valve for your faucet and check for leaks. When you're ready to start up the water filtration unit, turn on the inline valve and check for leaks.